In 1953, a young idealistic former teacher from Kamloops graduated from library school at the University of Toronto. Her name was Melva Dwyer. Neil Harlow, UBC’s University Librarian at the time, travelled to Toronto to hire new graduates, was impressed by Melva’s background in history and music, and hired her as a junior librarian. Melva had a Diploma in Piano from the Toronto Conservatory of Music and a Master’s degree in history from the University of British Columbia. While studying at UBC Melva boarded with the family of the art critic, H. Mortimer Lamb. There she found herself in a home frequented by well-known painters, such as Jack Shadbolt, Lawren Harris and Molly Lamb, and musicians such as Arthur Benjamin. Melva was originally assigned several hours a week to the Fine Arts Room where her knowledge of music was particularly helpful. A promotion to the rank of Librarian Two followed. In 1965, Melva’s position was renamed Head Librarian of Fine Arts and the Fine Arts Room was named the Fine Arts Division. With the 1964 H. R. MacMillan three-million-dollar donation to purchase books and serials, Melva Dwyer’s role in the library became more important than ever. She would now have free reign to build the fine arts collection into one of outstanding value to the university and to Western Canada. David Mirvish Books in Toronto was phoned every Monday morning because of their advertisements in the weekend Globe and Mail. Visits to Los Angeles to buy books from Hennessey and Ingalls and trips to London yielded further treasures. Among these were William Hogarth’s Analysis of Beauty (1753), Journal des Dames (1810–1844), and Pompa Introitus honori serenissimi principis Ferdinandi Austriaci (1641). Melva was frequently away on buying trips or developing connections with other libraries in eastern Canada, England, and the United States. She established a Canadian Art Libraries Section (CARLIS) within the Canadian Library Association, and was active in other organizations such as the International Federation of Library Associations (IFLA), the Council of Planning Librarians, and the Art Libraries Society of North America (ARLIS/NA). There were meetings with local fine arts librarians to co-ordinate the purchase of expensive reference books and new serial subscriptions. Melva was not afraid to set high standards of excellence in her division. She received loyalty and respect from her own staff, evident by the length of time they worked for her. Recognition and respect was not just local. 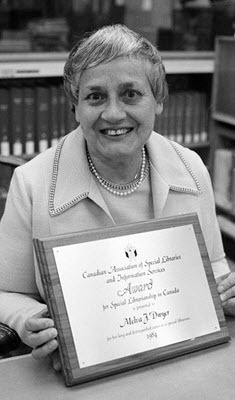 In 1984, she received an award of distinction from the Canadian Association of Special Libraries and Information Services. A year later ARLIS/NA started an annual Melva J. Dwyer Award for the most outstanding art reference book published in Canada. Extracted and edited from: Cooper, Diana; McBride, Peggy. 2006. “Reflections through the looking glass: The Story of the Fine Arts Library at the University of British Columbia.” In History of Art Libraries in Canada.